Two elite National Security System (NSS) agents, Hyeong-jun (Byung-hun Lee) and Sa-woo (Jun-ho Jeong), who were sworn blood brothers, both fall for fellow agent Seung-hee (Tae-hee Kim). Sa-woo attempts to suppress his feelings for Seung-hee and wishes the couple the best. Hyeon-jun is then sent off on a solo mission to Hungary. In Hungary, Hyeon-jun accomplishes his mission and while in escape mode becomes wounded. Shortly later, Hyeon-jun finds out that he was betrayed by fellow agent Sa-woo. Seung-hee attempts to help Hyeon-jun escape, but a car explosion separates the two and both are misled to believe that the other person are dead. Hyeon-jun is then saved by an unknown voice and learns of the secret society “IRIS”. 1. “Iris” has a reported budget of over 20 billion Wons (1 USD = 1,200 Wons), making it the most expensive Korean drama to date (10/2008). 2. The series is a high-tech spy drama and will be filmed in various locations including Hungary, Russia, Japan, US, and China. 3. Actor Byung-hun Lee will make his first starring TV drama appearance since the 2003 SBS series “All In”. 4. Actress Tae-hee Kim will make her first starring TV drama appearance sine the 2004 SBS series “Love Story in Harvard”. 5. Filming began March, 2009 in Akita Prefecture, Japan. 6. 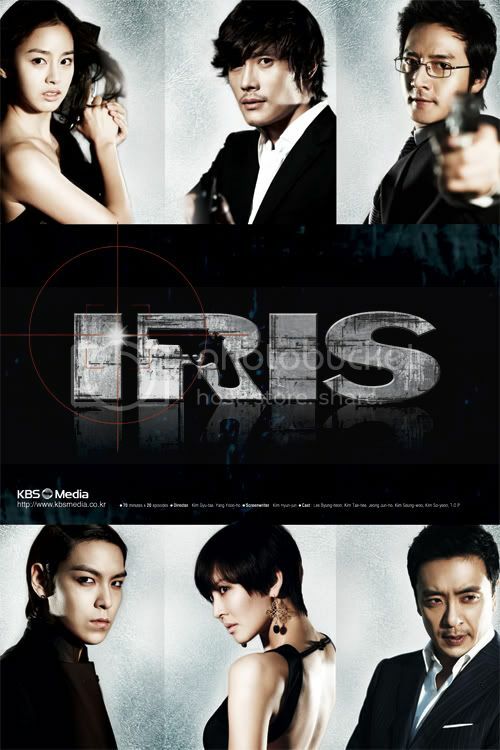 Japanese distribution rights for the drama series “Iris” was sold to TBS for a record ¥ 400,000,000 / ₩ 5,300,000,000 ($4.3 million USD). yeah~ TOP is in this drama~!! why he is not the main character???? The greatest Korean Action Drama. Thank for all Sub!